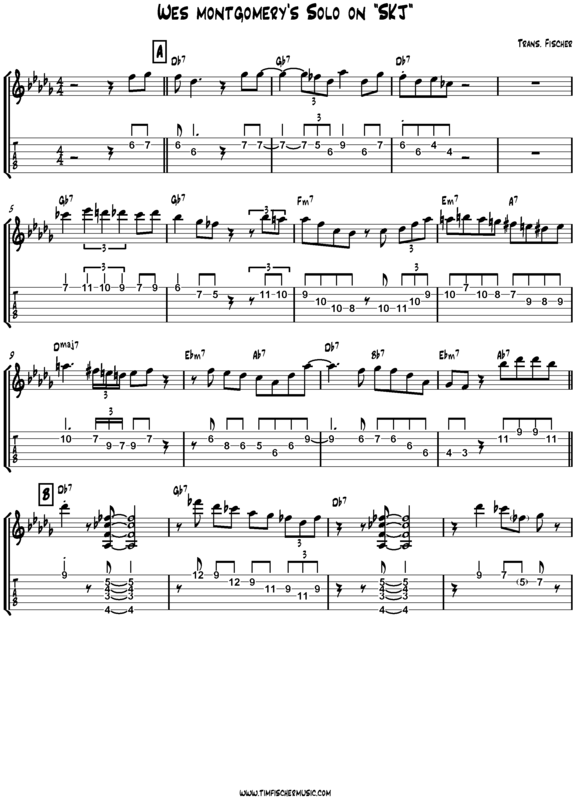 “SKJ,” written by the vibraphonist Milt Jackson and named after his wife Sandra, balances the meodic simplicity of a repeating, minor pentatonic riff with solo changes that feature an altered twelve-bar blues progression in the key of Db. 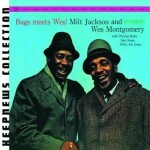 This particular recording documents the collaboration of the song’s composer, vibraphonist Milt Jackson, with guitarist Wes Montgomery on the 1961 album Bags Meets Wes. The soloists are supported by the amazing rhythm section of Wynton Kelly, Sam Jones, and Philly Joe Jones. On “SKJ”, the rhythm section is given a chorus up front to establish the tempo of quarter note = 112, and, in the process, demonstrate that simple quarter notes can swing when played by masters of time and feel. Montgomery’s two-chorus solo is performed exclusively in octaves; I’ve distilled the transcription down to single-notes to help facilitate easier reading. 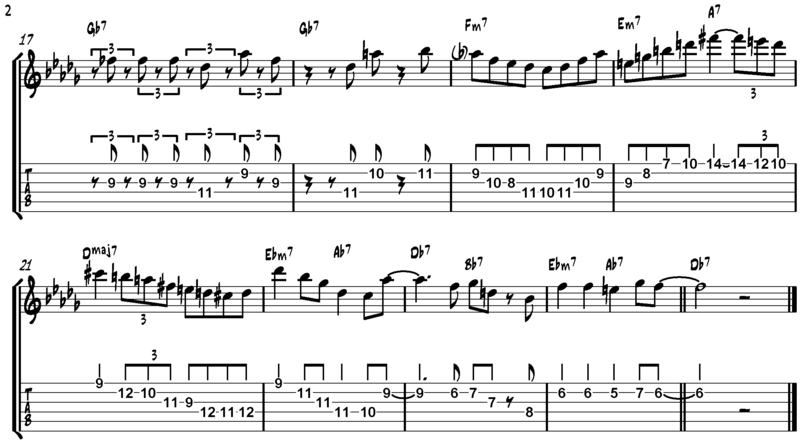 The reason I was attracted to this solo initially is not because of Montgomery’s impeccable octave technique, but because of his amazing time feel, phrasing, and beautiful note choice, especially when tackling the altered harmonic progression that occurs in measures 8–11 (Emin7–A7–Dmaj7–E♭min7–A♭7–D♭maj7). Montomery is a master at melodicism while still addressing the underlying harmonic progression, a skill that is demonstrated throughout this solo.